Lead has been in the news frequently, nationally and in New Jersey. It is a toxic substance that causes neurological damage, especially to young children. Lead in drinking water is one source of exposure. As indicated by recent drinking water test results from some schools in New Jersey and nationwide such as the widely-publicized crisis in Flint, some drinking water taps are testing high in lead. To explain why this is happening and to put it in a broader context that considers other water infrastructure needs, the Jersey Water Works Steering Committee has issued a statement. Jersey Water Works has also convened a collaborative task force to develop a practical, broadly-supported action agenda to eliminate lead in drinking water throughout New Jersey. Additionally, Jersey Water Works has developed this library of resources to help educate our constituents on lead in drinking water, including its effects and best-practice solutions for communities, utilities and residents. 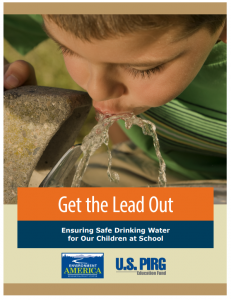 This report, Get the Lead Out: Ensuring Safe Drinking Water for Our Children at School, by the Environment America and U.S. PIRG Education Fund provides recommendations for states and communities to address the problem of lead in drinking water in schools across the nation. EDF and collaborators at Cornell published a new study that provides insight into how disclosure policies can impact potential home-buyer and renter behavior. 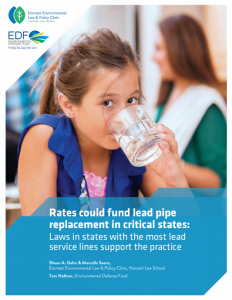 This effort builds on a report EDF published in 2017 grading state housing disclosure policies according to their ability to help homebuyers make informed decisions about lead service lines (LSLs) before they sign a sales contract. 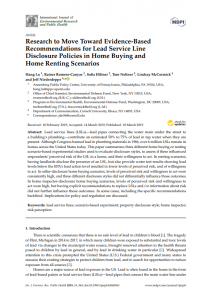 LSLs are pipes that connect homes to the water mains under the street and are a major source of lead in drinking water. Four states — Connecticut, Delaware, New York, and Pennsylvania — and Washington, DC scored an A-. 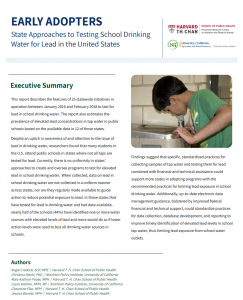 Twenty-one states scored a D or F. The remaining 25 states scored a B or C.
This report, State Approaches to Testing School Drinking Water for Lead in the United States,describes the features of statewide initiatives in operation between January 1, 2016 and February 28, 2018 in 24 states and the District of Columbia to conduct testing for lead in school drinking water, and the prevalence of elevated lead concentrations in tap water in public schools based on available data. To identify and summarize the features of state policies and programs, researchers conducted online searches using a search engine and by scanning state legislative and department websites and existing resources from public health organizations. 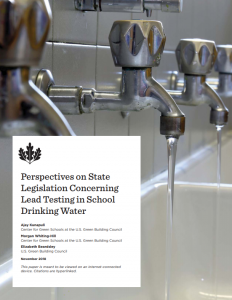 Researchers communicated with state government agencies to verify their policy or program and to request relevant documents and up-to-date data on water quality test results for lead.